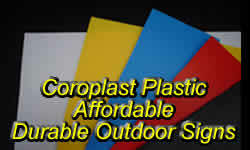 Most signs we make are made with corugated or " coroplast " plastic or banner material. These signs are cheap in price and outdoor durable for up to 3-5 years or more. I've had one on each of my gates at my house for over 5 years now and they still look great. Currentyl OFFLINE: Also see our full listing of Beware of Dog signs and more. Corrugated Plastic Signs - around $3.50 per square foot of sign at sizes of atleast 2ft by 4ft in one color. For Example, a 4 ft by 8 ft sign would be around 96 dollars in one color. Adding extra colors, printing effects, shadows, and outline will cost extra. Adding a shadow effect to the whole sign would approximately increase the price by 50%. Due to there awkward sizes, large coroplast signs are for local customers only. 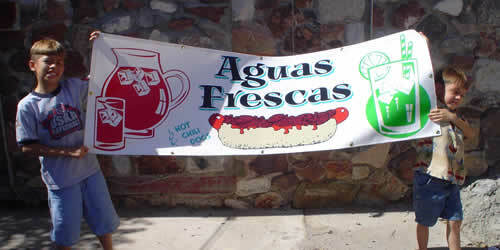 Full color printed banners - approximately $5 per square foot. (plus design charge -if any). You can submit any picture or design for a full color banner. We can ship a banner too. Colors = We have a many colors to coose from. Adding colors and digital printing effects are extra. For example - Adding a silver shadow or outline to the text on a sign. We can also add full color prints to a sign. An Example of this would be a picture off you standing to the side of the text on your sign. Sizes = The biggest corrugated plastic sign we currently make is 8 ft by 4 ft. Please contact me for special requests. We can make practically any size sign smaller than that as well. Sizes for banners can be as large as 10 by 20 foot. **We ship banners! But at the moment we are only making coroplast signs for local customers so you'll have to stop by the shop and see us about exact pricing and colors.